I’ve been planning to share my collections, I always receive questions where did I get mini stuff, where on Earth did I buy these miniature things etc. Today, I give time to show you my tea set collection and don’t worry I’m planning to show you all my collections and even tour you to my kitchen soon. Currently I have 5 tea sets, I took pictures with their measurements to give you an idea how small they are. Let’s start to my first ever miniature tea set. The Miniature Tea set Family Bear, I bought this for 100 pesos only, oh yeah you heard me right 100 pesos only no more no less, lucky huh? Cup’s measurement; 1 & 1/2 inch diameter and 1 inch high. Sugar jar’s measurement: top 1 inch and height is 1 & 1/2 inch. Milk jar: Top measurement less than 2 inches while its height is 1 & 1/2 inch. 2. Miniature Frozen Tea Set I bought this one in Toys R Us. Me and my niece was looking for some toys for her, I was so thrilled and excited when she showed what she found. I bought this just for 250 pesos only. The quality is just okay, I am fan of Queen Elsa but honestly I don’t like the print maybe because I would like to see the realistic design like floral or anything that I usually see on the normal size of tea set but I am so happy to have this since this is a miniature and I can put real hot water in it. Yehey!!! Cup’s measurement: Circumference 1 & 1/8 inch, height is just and inch. 5. Miniature Autumn Tea Set. 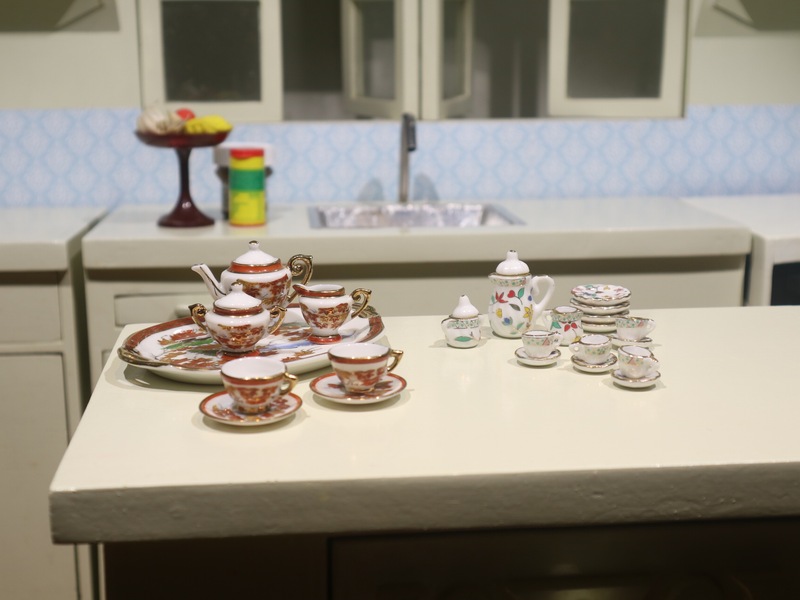 This set is a gift from my Youtube friend Loki, who really loves miniature cooking. At first when she told me that she would send me a package I thought she was just joking but when she sent me the picture of it together with my address, I was not able to sleep for months, until I received the package, she also gave me miniature spices, Nutella (which are edible) and mini bowl . Thank you so much Loki! This miniature autumn tea set was made in high quality material, extremely flawless and the design is very realistic. This scale is perfect with the 1:3 and 1:6 scale kitchen. Having these kind of collection is giving me happiness. I can’t wait to share more. Let me know if you have collection too, you can send it through my email or send it on my Facebook fanpage. It’s pleasure to meet toy collectors and sharing experiences and thoughts about collecting.